Every now and then someone tells you about a little gem you have never heard of. Bingham, in Richmond, had just earnt its first Michelin star, earlier this year, when a friend suggested I should check it out. The newly refurbished, Bingham Restaurant is part of a boutique hotel overlooking the Thames. Head Chef, Shay Cooper has worked the kitchens of Putney Bridge, Juniper in Altrincham, The Vineyard at Stockcross and Endsleigh in Devon, where he was awarded 3AA rosettes. Gourmet Traveller and I had decided to meet, for the first time, over lunch, of course. The whole menu looked inviting to me and we were both indecisive. Thank goodness the waiter suggested the set seasonal lunch menu. Immersed in conversation with Gourmet Traveller, I deleted the best of the entree pictures. 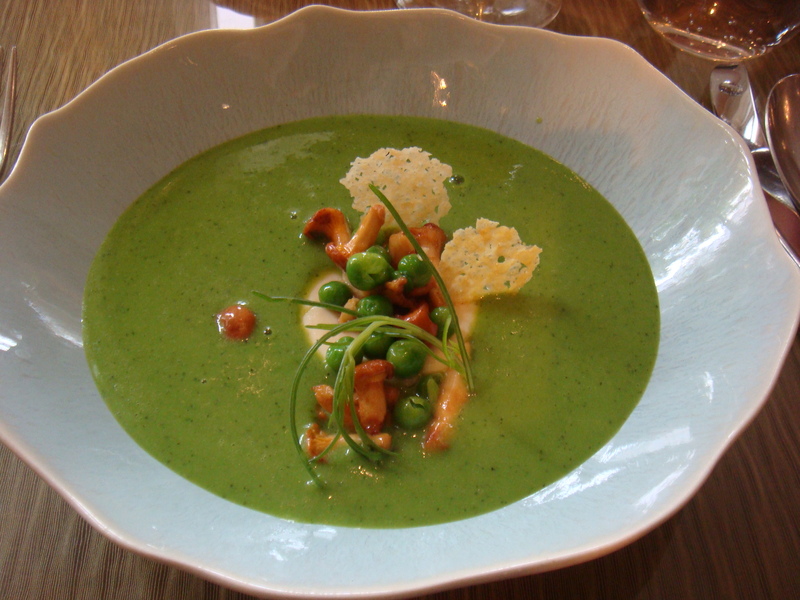 The Chilled Pea Soup, scottish girolles, Parmesan royale, and herb oil does look beautiful though. The chilled soup was a perfect temperature accentuating the fresh summer pea flavour. The Parmesan ‘custard bake’ provided a different texture to the dish along with the tiny salty Parmesan crisps. You didn’t see the bottom of the bowl but the glaze on the bowl was beautiful too. 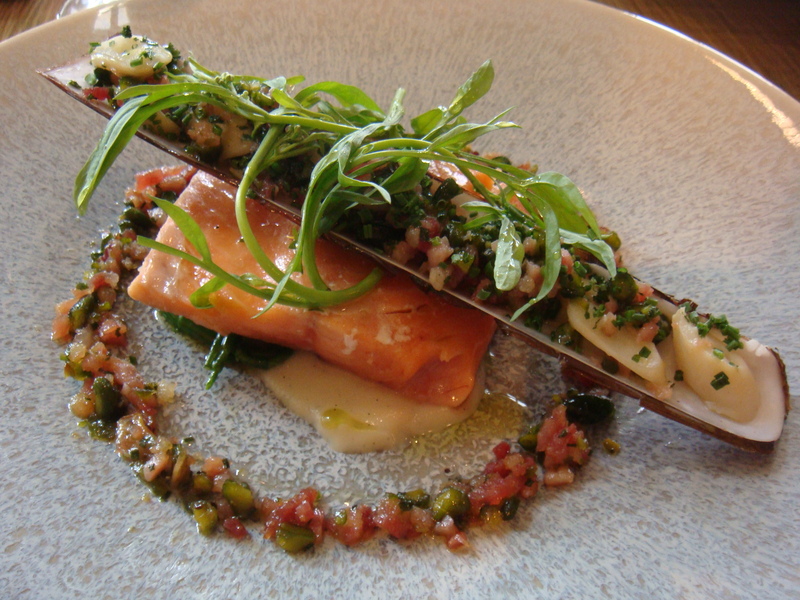 Organic Sea Trout, celeriac and vanilla, razor clam, pistachio and bacon. Another beautiful presentation. I really enjoyed this dish and thought the inclusion of the bacon really brought the dish together. The sweetness of the celeriac, vanilla and razor clam benefited from the balance the bacon brought. The sea trout was not over cooked and a surprise roll of samphire underneath it pleased me even more. There were two choices on the set lunch menu. Strangely I didn’t feel like the lemon tart, which I generally hold a fondness for, but chose the vanilla parfait option. The vanilla parfait, strawberry sorbet arrived to have the raspberry and thyme consumme poured into the bowl at the table. The parfait rolled in ground gingerbread was really too creamy for me, even with the tart raspberry, and strawberry sorbet it wasn’t enough to cut through these dense creamy little rolls. Gourmet Traveller opted for the mint tea with petit fours. There were quite a few, so I stole a tiny blood orange jelly. lovely. I have to say my whole experience at Bingham was lovely, yes Gourmet Traveller and I had lots to talk about too! Bingham have a large bar area with tall french doors opening onto a terrace, somewhere you could imagine whiling away the afternoon hours. The staff were friendly and every thing was served in a timely manner. 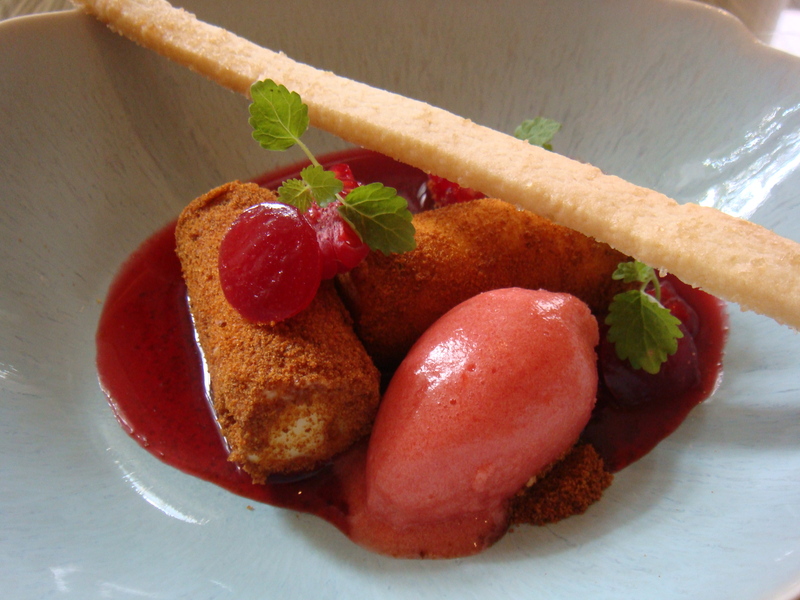 The set lunch menu was a steal at £23 for 3 courses and the A la Carte menu £39 for 3 courses. I hope the people of Richmond are making the most of the Bingham. I wouldn’t hesitate to.